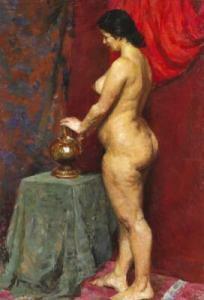 Find artworks, auction results, sale prices and pictures of Alexandre Romanitchev at auctions worldwide. 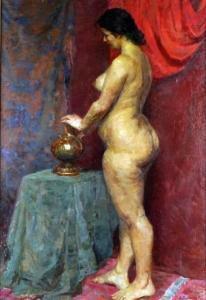 Romanychev Alexandre Dimitrievich (1919-1989), Russian School. 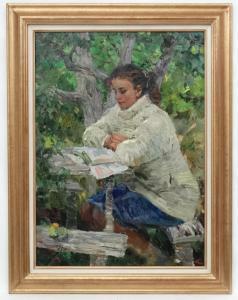 Oil on canvas, "Reading in the garden", Girl sat at table before a tree. Signed lower right. 31 3/4 x 23 2/3" CONDITION: Please Note - we do not make reference to the condition of lots within catalogue descriptions. We are however happy to provide additional information regarding the condition of items on request. 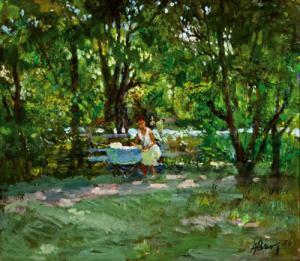 Alexandre Romanitchev - "en El Jardín"